This is a new and (almost) unique service we're happy to trial for trade customers. Let us deal with all the packing and posting for you! Obvious as it sounds, some of our trade customers use tartan ribbon rather than sell it - florists, card makers, stationers, interior designers etc. whereas other trade customers sell it, so if you are in this category and you have a customer who needs even just one reel of ribbon urgently, you can order for them on this site. Order and pay as normal but enter the customer's details as the shipping address. Add a note in the COMMENTS box to say that this is your customer and we won't enclose a delivery note. The customer pays you the retail price (your own private transaction which we don't get involved in!) and you pay the trade price without even touching the product. You save time by having the ribbon posted direct and you save on the onwards postage, packaging and admin costs. Please note that during the trial period we can only offer this service for delivery addresses in the UK. One thing - our sale is with you, not your customer. So if they have any questions, aren't in to sign for the package, or change their mind and want to return it, this is something you need to deal with. Sorry if that sounds a little obvious but this is the one area where we see potential problems so want to be totally clear about this from the outset. We've all been in the position where a customer needs something quickly but we don't have it in stock . . . it's frustrating, but this could very well be the answer. Help the customer and keep the sale by letting us do the work for you. 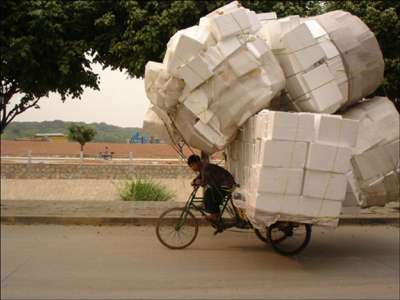 We send hundreds of parcels all over the world every week, so it's really no big deal to send a few extra. We can't promise we'll deliver them all by bicycle(!) but we're happy to trial the idea and hope you will be too.